Heat oven to 400°F. Melt butter in 10-inch skillet over medium heat. Cook onion in butter 4 to 6 minutes, stirring occasionally, until tender. Cut cheese to fit bread. 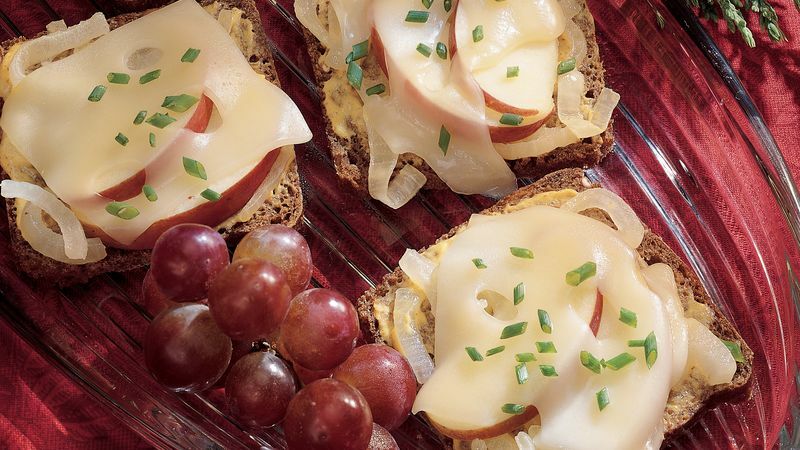 Spread each bread slice with Dijon-mayonnaise blend. Top each with onion, apple and cheese. Sprinkle with chives. Place in ungreased jelly roll pan, 15 1/2x10 1/2x1 inch. Bake about 5 minutes or until cheese is melted. Serve warm. Canapés are small, decorative pieces of bread topped with a savory garnish. Serve them hot or cold, with bread toasted or not. The topping can be a simple spread or an elaborate collection of ingredients. Use two serving trays for each party appetizer served. When one tray is on the buffet table, the empty tray can be refilled in the kitchen to quickly replace the other when needed.